So - where IS your house? This is a question we get asked often - and a question that has taken a while to find a useful answer to. We could, of course, say "Preuilly sur Claise" and leave it at that, but it would only lead to further questions. Or we could answer "the South Touraine" but like most of the answers available that presupposes a knowledge of French geography (the French is "Touraine Côté Sud", but that additionally requires careful use of a French accent). 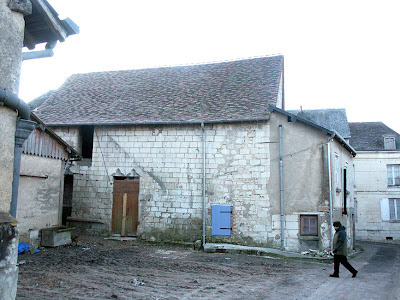 "Touraine" is also accurate, but of a pre-revolution nature. Even more pre revolution would be the answer "in the Duchy of Guienne (Aquitaine)", but at some time it was also in the County of Anjou. A more modern answer - Indre et Loire - is also correct, being the département that Preuilly sur Claise is in - but what does it tell anyone who doesn't know France well? If were were in Normandy, people would instantly form an idea - somewhere up north, on the D-day beaches with cider and calvados. 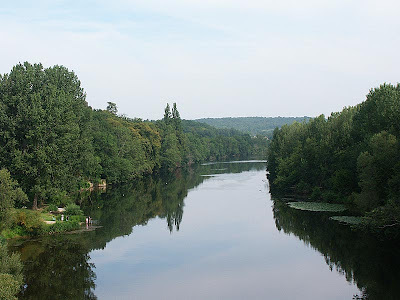 Or even Dordogne - in the middle with rivers and caves with rock paintings and stuff. Indre et Loire has no resonance like that. Centre - the region we are in - means even less. So: What we tell people is that we are at the edge of the Loire Valley. Geologically, politically, historically and ecologically this is correct. It also gives people an idea of where we are - somewhere in the middle, sort of on the left hand side. This is the Plan d'Eau ("water level") which refers not just to the pond but the area around it. A plan d'eau is a leisure area, complete with water, which is purpose built for communal use. I don't know if the water in Preuilly's plan d'eau is ever used for leisure activities, but the field is where some local events are held - the Brocante Vide-Greniers, or attic clearance sale - being one. It used to be crossed by electricity pylons, but these were demolished last year - one assumes they were no longer in use and just cluttering the place up. 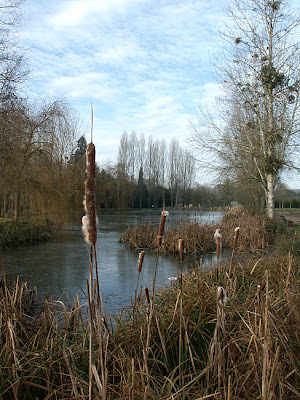 The photo was taken on Christmas Day, when the pond was frozen. 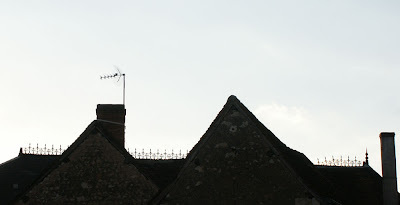 It's been a while since I have posted any pictures of a roof.......... so here goes. Seen in Preuilly - if you look up! Over Christmas we stayed again in Roux. 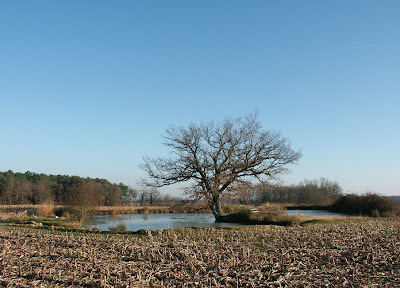 There were a couple of very cold but sunny days, which gave us an opportunity to go for a walk and take some photos. 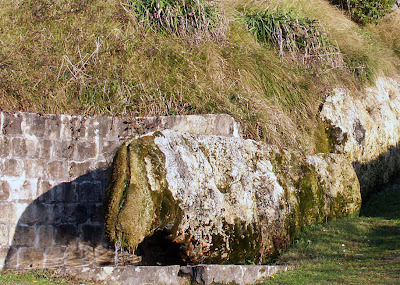 Above the hamlet of Roux is Preuilly's water supply - a string of ponds and dams. This is one of the them. The water supplier in Preuilly is the commune itself, so I guess in a way that Susan and I are shareholders. As such, we approve of the views our company provides. My Uncle Geoffrey reckons this restaurant gave him the best food he has ever had. Susan loves the food there too - she thinks Madame's ability to combine flavours is superb. She says that although the description on the menu often only gives you a basic idea of what the dish will be, Madame is one of those people you can trust to produce something delicious, even out of ingredients you didn't think you liked. At the moment the restaurant is for sale, which is a real pity. In a previous post Susan mentioned Le Chameau. Apparently, "ses concrétions calcaires réputées parmi les plus belles de Touraine" (its limestone concretions are renowned as amongst the most beautiful in the Touraine). Building of Tours Cathedral (Cathédrale Saint-Gatien de Tours) started about 1170 and continued at what appears to be a rather relaxed pace over the centuries until 1547. 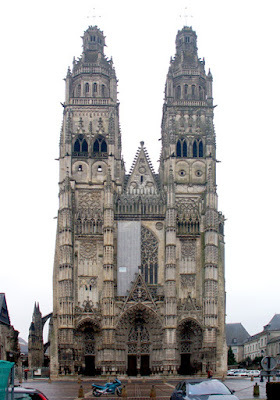 It was built to to replace a half built cathedral that was burnt down in 1166 during a border dispute between Louis VII of France and Henry II of England. Because the builders took so long even once work had started, fashions in architecture changed a number of times. It was started in what the French call the "Romaine" period (the rough equivalent of Norman style in England) and finished in the middle of the Renaissance. These changes in style are most obvious on the towers on the western end of the cathedral, but they also show inside. While the towers were working skyward, the nave was being built from east to west, the first (the choir and sanctuary) being 13th Century, with additional bays being added until it met up with the towers. The stained glass isn't as famous as that in Chartres Cathedral, but also dates from the 13th Century and is (IMHO) equally spectacular. I think the reason it isn't as well regarded is because the glass at Chartres is almost completely of one date. 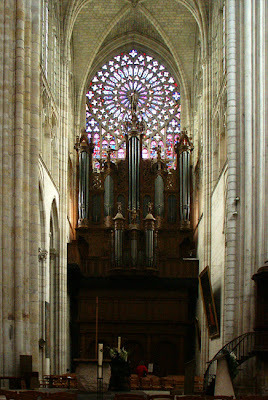 In Tours there are a number of pieces of modern stained glass, and a lot of clear windows. 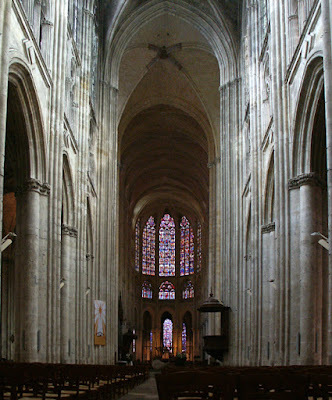 We went to the Cathedral during a lull in the action between us and the Préfecture in Tours (Paperwork, especially in France, needs to be done in small steps). It was a cold day, but inside the Cathedral it was positively arctic. There were a number of little piles of envelopes scattered around wherever there was a table, encouragingly stamped with the word 'chauffage' (heating). The area known as the Brenne was created in the Tertiary era about 40 million years ago, after the sea had advanced and retreated a number of times. It is a vast shallow bowl, part of the even bigger Paris Basin, collecting water coming off the Massif Central. Over time, clay has accumulated in the depression, creating an impervious base. In many places the deposits are rich in iron and have formed an intermittent layer of sandstone very resistant to erosion and known locally as 'buttons'. 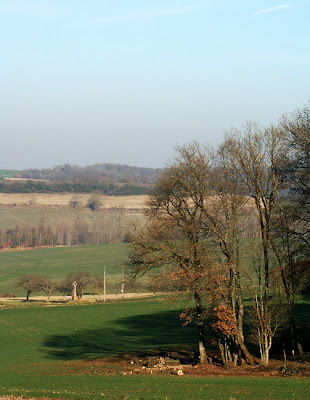 In the Miocene, about 20 million years ago, the sea encroached for the fourth and last time up the Loire Trough but was stopped by the low hills between Ligueil and Ciran. 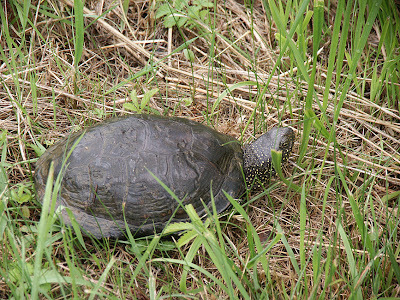 After this the Brenne became a vast wooded marsh, not yet cut by river valleys. 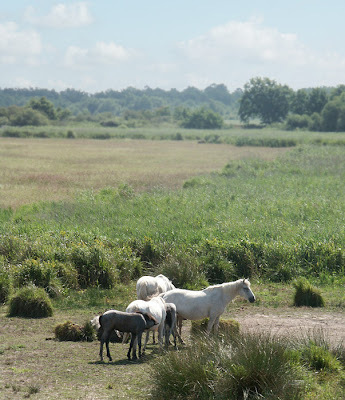 A small herd of Camargue horses (introduced) in the Brenne, seen from a bird hide. Finally, a little over a million years ago, thanks to the Ice Ages, water courses cut deep valleys across the plain. The ice itself never reached the Brenne, but the moving sediment it caused resulted in the erosion of the softer soils, leaving the hard buttons emerging from the landscape. The new rivers left their own sandy deposits too and so the diverse mixture of soil types we see today was established. Amboise is a town I have never got to grips with. Probably because the first time I went there the whole town was shut and I ended up staying at an Ibis motel rather than a character filled hotel. There is a huge chateau at Amboise. Started in the 11th century, it became a royal palace in 1434 then was extensively rebuilt (in the 1490s and again in the 1570s) but by 1650 had been turned into a prison. By the time of the French revolution it was virtually derelict and so most of the chateau was demolished. By the 1840s the chateau was once again in private hands and a start was made on restoring it, but it was damaged again in World War Two. What now remains is basically a 19th century rebuild of about one fifth of the original. As you can see though: from across the river it is still an impressive - and imposing - structure. Just down the road is the Clos Lucé, a manor house where Leonardo (no-one called him da Vinci before Dan Brown) lived the last 3 years of his life. 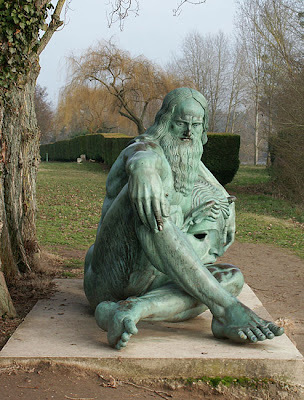 In the grounds of Clos Lucé are some recreated models of some of Leonardo's inventions. One thing Amboise has in abundance is tourists. It certainly seems to be a popular destination for Americans in particular and it's a bit of a puzzle to us*. It's not that there is anything wrong with the town - indeed, it is attractive - but so are many, many other small but rarely visited French towns. It has history - stuff happened at Amboise, interesting people lived in the town - but again, stuff that was just as interesting happened at places that are not packed like a sardine can full of tourists in the summer. At the moment it reminds me of a sacrificial anode - the tourists wear out Amboise while the rest of France gets on with life undisturbed. *My theory is that at some stage Amboise appeared on US TV, either as a location in a drama or a recommended destination in a travel documentary. Certainly the same thing has happened in the the UK at places like Goathland, the setting for "Heartbeat". I have been there twice, and it is just a pretty normal Yorkshire village teeming with visitors when the villages around are empty. Just as strange to me is my reaction to seeing on TV places I have previously visited. For some reason that not only validates the place as having been worth visiting, but also makes it more real. 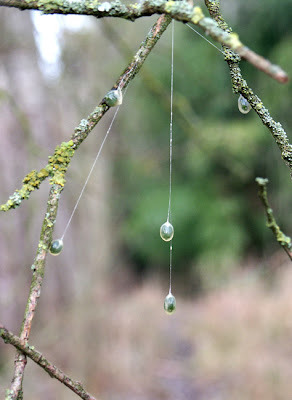 I am sure there is a more delicate way of putting this... but the photo below is of bird pooh. Or maybe more accurately, probably the droppings of a Mistle Thrush. 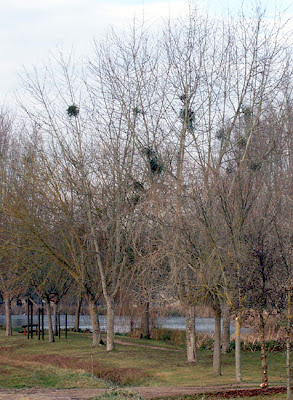 This common European bird eats mistletoe berries and after processing, excretes them. The berries are covered in a very sticky goo, which sometimes necessitates the birds scraping its backside on a branch to dislodge the seeds. Having craftily worked it's way to a place out of harms way, the parasitic plant sprouts, and the cycle resumes. I bet you wish you hadn't asked now! Barrou is a village on the river Creuse, downstream of Yzeures. It has a population of just over 400 people, a Boulangerie, a few other small shops, and a very nice - if somewhat short - terrace and walk along the river. 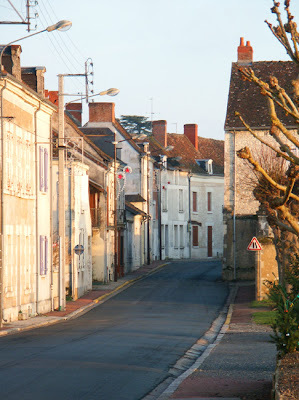 We have driven through the village a couple of times, usually while taking guests to see the Château at la Guerche. This Christmas we stopped and had a wander along the river. We do like the rivers in this part of France. Coming from a part of Queensland more noted for its droughts than anything else, even after 10 years in London we get a frisson looking at wide, slow flowing water. Here is a map of how to get there on the picturesque route from Preuilly-sur-Claise. One of the reasons we bought a house in Preuilly sur Claise was the town's proximity to a large and very special nature reserve in an area known as the Brenne in the départment of Indre. 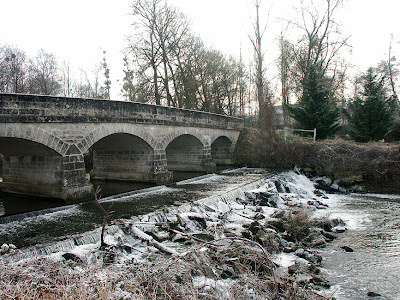 Preuilly is about 15km from the western boundary of the Parc, in the next départment, Indre et Loire, and situated on one of the three rivers that flow through the Parc. 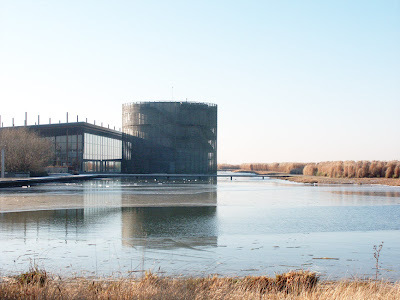 The Parc naturel régional de la Brenne was created in 1989, and includes 47 communes (local administrative districts). The area is largely rural and covers an area of about 167 000 ha with a population of 31 000 residents in the Parc ie fewer than 20 people/km². It is situated just to the west of Chateauroux and east of Poitiers, south of the Loire in central France. 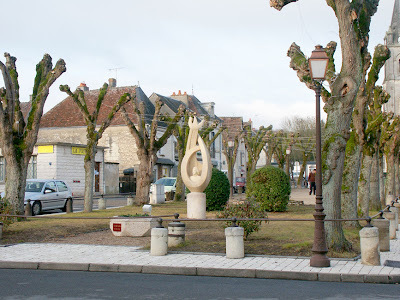 The N151 road runs through the middle and through the largest town within its borders, Le Blanc. 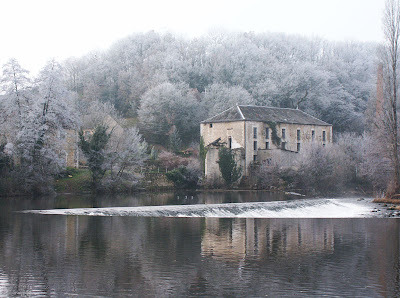 A mill on the Creuse at Le Blanc in December. 5. To engage in experimental activities or best practice to achieve the above objectives and to contribute to research programmes. The Parc is administered by a syndicate made up of regional, departmental and communal representatives. 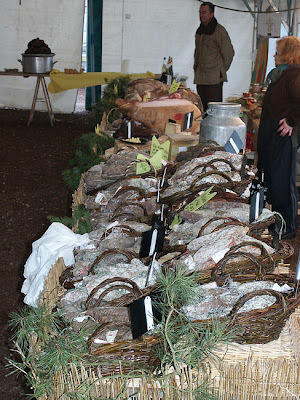 As Susan mentioned earlier, just after Christmas we went to the Truffle fair at Marigny-Marmande with Howard and Janet. Not surprisingly, the main business of the day was truffles. We have a feeling that we missed the real wheeling and dealing, but there was still plenty of truffle to be had, as can be seen in Henri Proust's photos here. For some reason, I managed not to take any pictures of truffles of the fungi kind, but did get a photo of the other, more chocolatey sort. Although truffles are expensive, the pricing is very easy to understand. A category 2 truffle costs 1000€ a kilo, that is 1€ a gram. A small truffle - about walnut sized - will set you back 15€ - 20€, which would be plenty for a 2 person recipe. Declassée truffles are 600€ a kilo, and the main criterion for declassifying them seems to be irregular shape. (As you can tell, we are experts already!) 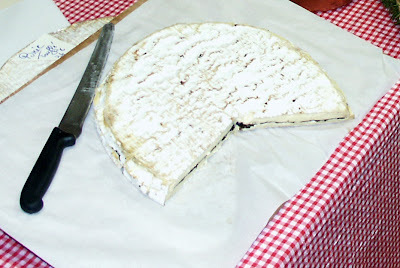 Along with the truffles au naturale was a range of specialities with added truffle, including brie sliced through the middle and spread with a layer of truffle (possibly truffle butter). 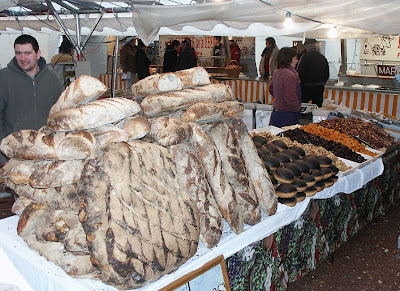 As well as truffles, the fair had plenty of local produce, including a fine selection of breads. Behind the unfeasibly large bread you can see the burnt tops of Tourteau Fromager (cheese crab), a Poitevin sponge cake made with chèvre and eaten as a dessert. There was also a good range of hams and saucisson (salami style sausages), chicken and duck products (including foie and pâté of all kinds), snails, fruit and preserves. 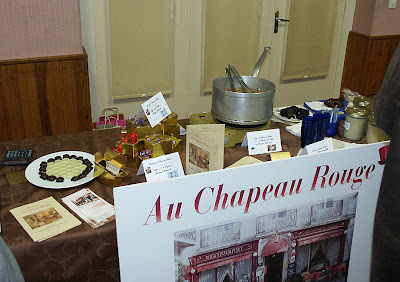 Now we have been to a truffle fair, we will probably go back every year to stock up on life's little luxuries. This Christmas didn't feel as cold to us as last year's, but we are aware that there was a seriously cold snap a couple of weeks before we arrived. Having said that, however, there were few days that didn't start off below 0C. A couple of times we had a deep fog, which combined with the cold was very.......interesting....on the roads. There were other evenings when the skies were clear, and the stars blazing. This led to some beautiful crisp mornings. 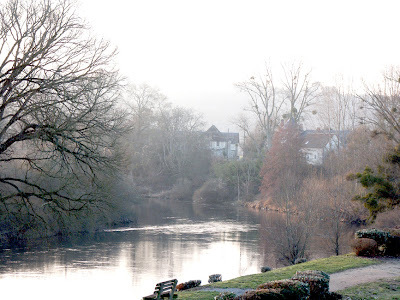 Yzeures is on the banks of the Creuse river (as the name suggests) about 10km (6 miles) from Preuilly-sur-Claise. Its population is about the same as Preuilly's, and it has our nearest large supermarket and hardware store. It was the birthplace in 1914 of Mado Robin, who went on to become the possessor of one of operas most remarkable voices, managing to sing higher in performance than anyone else of her period (D4 above high-C, for those who understand these things). She toured the United States and Russia before dying of liver cancer in Paris in 1960. There is now a museum in Yzeures which contains items of her stage costumes, and a statue in the main square. This is getting to be a habit. 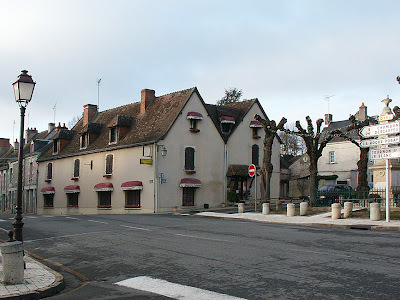 Once again, we rented Madame F's gite in Roux, but this time we drove down, rather than flying in. The viewing platform at the Baie de Somme. Note the ice. 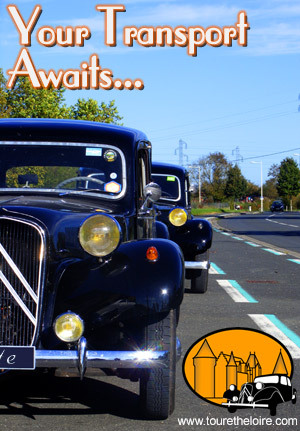 We stopped for fuel at le Clerc in Chatellerault, which may have been a mistake, as the car park was in turmoil - gridlocked, with staff trying to sort it all out. The joys of Christmas shopping, eh? We didn't go into the supermarche itself - we may never have got out. As for the rest of the break, we did hardly any work on the house, as it was so cold inside the windows had condensation on the outside. We did install some dry rot testers, and checked out the new roof in detail. The rest of the time was fairly social (as Susan's last post mentions) and pretty much just a holiday. New roof in all it's glory. We had quite a social time of it over Christmas and New Year and made some new friends, as well as catching up with people we have known for a while. Alan and Jane treated us to dinner in Alan's lovely home and a lively discussion about modern art. Apologies to the scaredy-cat who was obliged to spend the evening under the bed due to her house being invaded by strangers. A big thank you to Alan and Jane for being so kind and hospitable when we needed an urgent internet connection too. The Fête de la Truffe at Marigny-Marmande with Howard and Janet was a very gentle introduction to the archane world of truffle hunting, trading and preparation. We look forward to continuing the discussion on the relative merits of Kate Moss v Elle McPherson and are determined to win the €20 prize for coming up with the solution to the problem of the post in the middle of Howard and Janet's salle à manger. Talking forestry pratices and Preuilly politics over a glass of Kir Royale at 11.00 in the morning with Anne and Jean-Pierre and Mme L (Jean-Pierre's mother) was delightful. We want a dog just like Dylan and Mme L's cassis recipe. Meeting Alan and Jane and the Famille L is thanks to John and Jill, who we hope to see in Preuilly sometime this year. New Year's Eve was spent at Chris and Sue's place in the Brenne, along with their extended family and friends (who turn out to all live within a few miles of us in England - what a small world it is sometimes!) I am very envious of the beautiful ring Sue's sister got for Christmas and am not at all surprised that we caught her flashing it at Auberge La Gabrière - no need to be embarrassed - go for it girl is what I say! Sue and Chris will be on their way to their big Australian adventure now, and we really hope they have a fantastic time there. It was nice to catch up, however briefly, with Michèle (who owns the gîte we stay in when our house is too cold to contemplate camping in), the Famille Chedozeau at Hotel l'Image (although we didn't get to see the new wallpaper in the restaurant), Christine (our neighbour) and the whirlwind that is Céline (I will know I am approaching fluency when I can understand one word in ten of Céline's rapid fire French). Bengt and Suzanne - we missed you by about a week I think, but we did go and admire your new render.